In Nha Trang the hawkers were always there but I did not notice them anymore. They sold friendship bands, cigarettes, playing cards and everything else I could manage without. 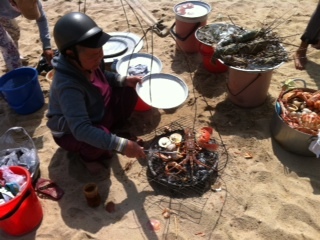 But as I sat on the sand and gazed idly out at the South China Sea, I noticed a lady in a conical hat with a pot of cooked lobsters hanging from a yoke on her shoulder. I got up and followed her across the beach, caught up and asked her how much. “Hundred thousand Dong,” she said. Just under three pounds; four and a half dollars, US. She segmented the lobster, so the meat was get-at-able with chopsticks, and halved a lime and squeezed the juice into a pot and stirred in pepper to make a simple dipping sauce. It was as much as the lobster needed. I wandered over to the fruit vendor later in the afternoon, just as she was about to pack up, and I only wanted a pomelo, but she stuffed a bag with two of those, a dragon fruit, a couple of bananas half a dozen mandarins, and nearer a dozen rambutans. “No, no,” I said; “I can’t eat all this”. “Okay for tomorrow,” she insisted and forced the bag on me. I did my best with it that afternoon and finished the rest in the morning, sitting on the beach and peeling fruit with my Swiss Army knife. Somewhere around midday, an old lady arrived and laid down her yoke and began to set out her stall. She lined up four pots, one filled with spiny lobster, a second with crabs, a third with tiger prawns and a fourth with sea snails, then shook ice onto platters and topped each with a little of the seafood and placed them on top of the pots. She lit the charcoal in a cast iron pan suspended from the yoke, laid a grill over it and let it burn until the charcoal glowed red and grey. This time, I got a lobster, a crab, two tiger prawns and sea snails dotted with curry paste for my 10,000 Dong. For the same money in London, I would get a miserable sandwich from one of the corporate chains and the mayonnaise would splat on my shirt and ruin my mood. Even an old, small, cooked-from-frozen lobster would cost twice as much back home. There are too many tourists in Nha Trang for the restaurants to be reliably good, but I found one on a quiet street a few blocks back from the beach, which was as dark and ramshackle as good restaurants tend to be in Southeast Asia, and had a menu of un-touristy dishes like stewed frogs with aubergine in turmeric broth. I ordered miến lươn trộn, which is sliced eel stir-fried in a hot wok and tossed with beansprouts, glass noodles, shredded mint and chilli then sprinkled with onion flakes. I was done, then, with Nha Trang and went back to my hotel, collected my bag and got an overnight train heading north. Beautifully written. I wish I knew as much about food. No fear of Delhi Belly? Thank you. My stomach is fairly reliable and I’ve only been ill twice, both after eating at decent restaurants – which I blame on not washing my hands properly/at all rather than the food. Street food in Southeast Asia, South America and Africa has never upset me. I use hand sanitizer routinely though. What a great story again! I love the lady in a conical hat.